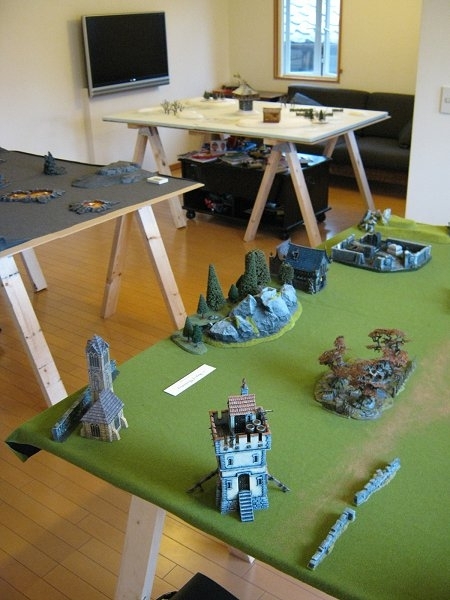 My colourful Tzeentch army is growing in size, and I spotted these good value flatpack kits recently on the net - the perfect home for my viking-themed marauders. The company that produces them is 4Ground.co.uk, a UK-based firm selling a wide variety of laser cut MDF board kits. 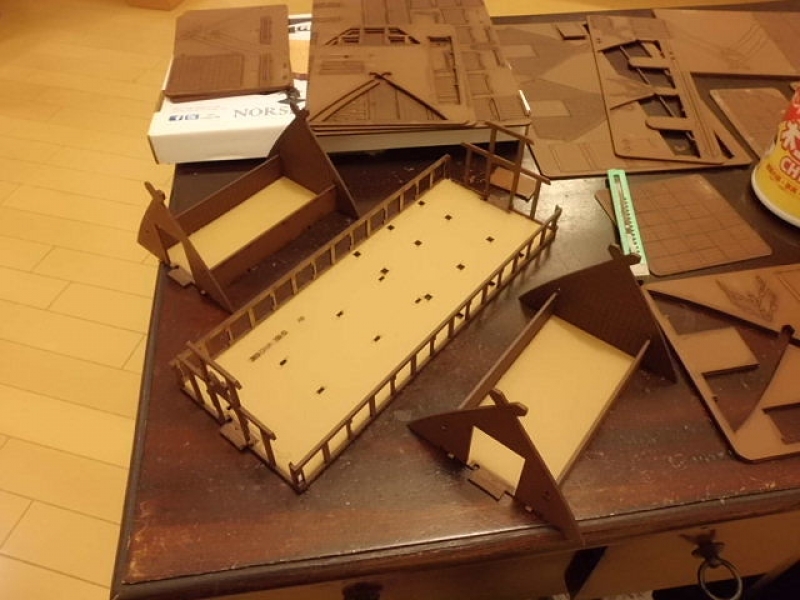 I bought one large longhouse, two regular longhouses, and one smaller storage hut, for approximately 50 pounds plus shipping (roughly 8000yen at time of writing). The kits come in individual bags (or a box for the larger building), with separate cuts of teddy-bear fur and full instructions. One neat thing I liked about these kits is that the exterior and interior walls are already painted, in a basic brown colour. So once you've assembled them, you can use them straight away. 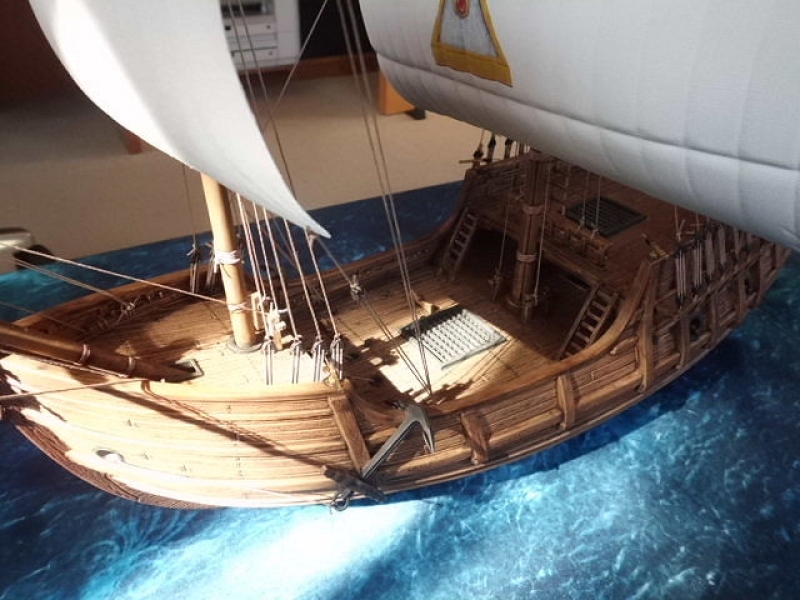 However the detail on the kit is fairly basic - mostly just planks of wood. So I decided to stain everything with an Agrax Earthshade wash prior to assembly, with an eye to light drybrushing once the kits were assembled. I assembled all the buildings at the same time, and these went together very smoothly. Instructions were very clearly marked, and I didn't have any problems here. The interiors of the buildings are very plain, but do have planking to match the exteriors, and you could add fireplaces and furniture if you wanted to. 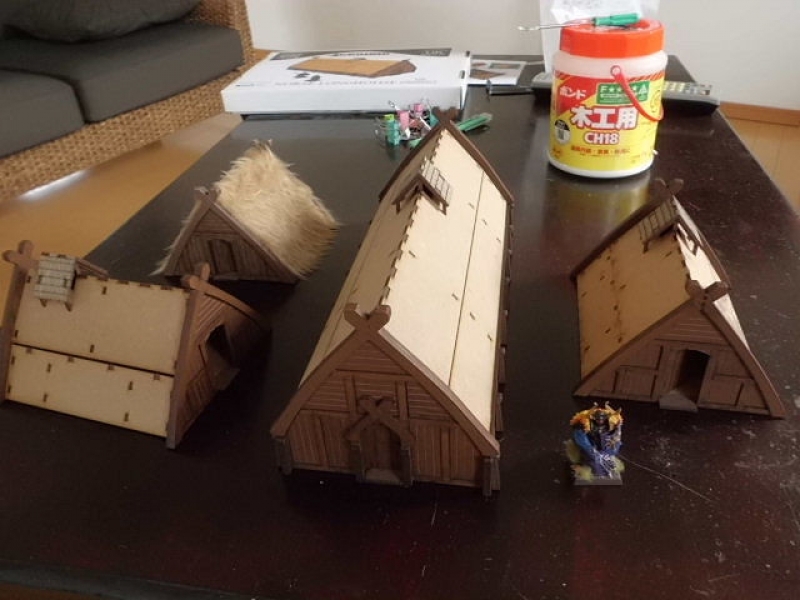 Here are the four buildings with their removable rooves completed. 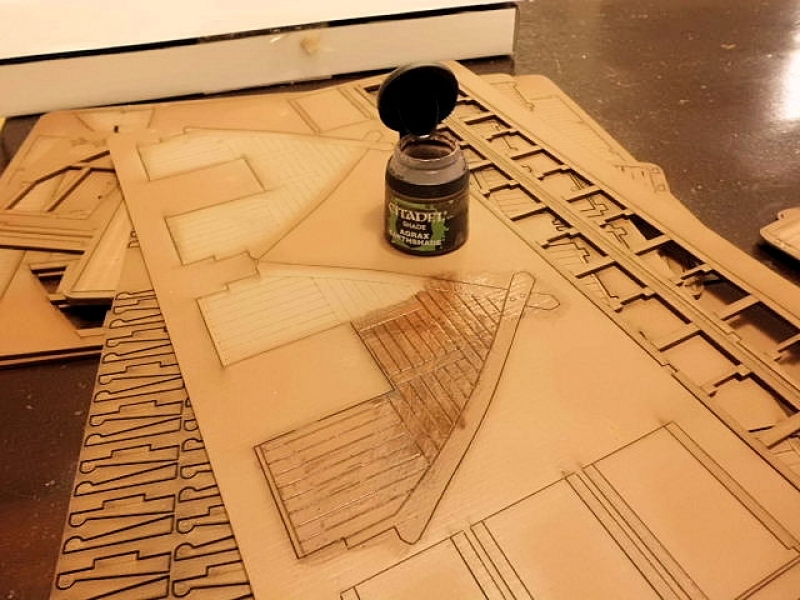 I felt the buildings all looked a bit too new and clean, so I lightly drybrushed the exteriors with a light brown to give it some age and faded wood effect. The teddy bear fur is already cut to fit, so it's a simple matter of sticking it down with wood glue. 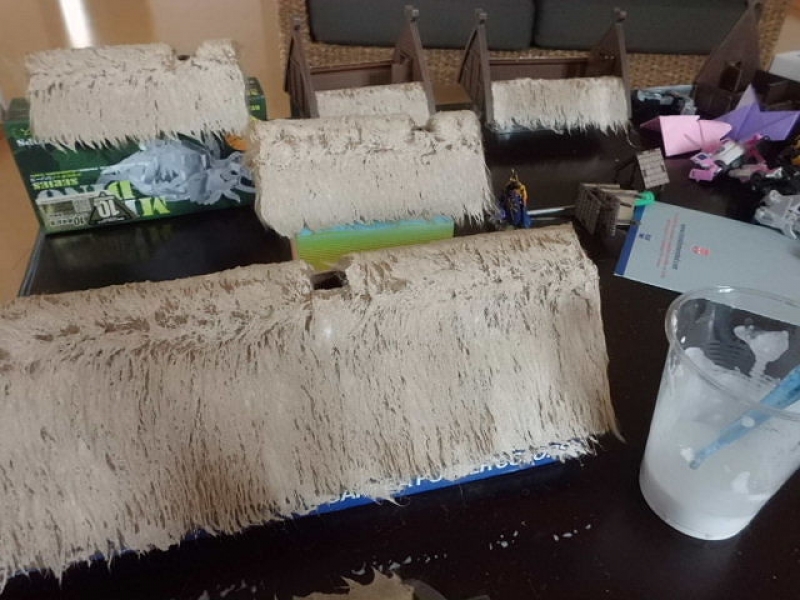 The final step for the buildings is to brush the teddy bear fur down with a 50/50 mix of water and woodglue, using a toothbrush. 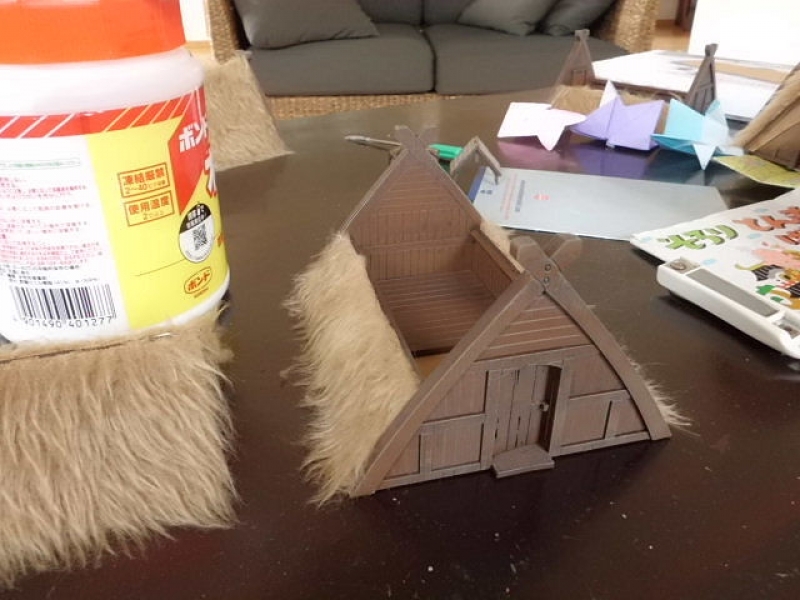 That pushes the fur into the right direction and hardens it to look like real straw thatch. Once it's dry, you simply trim the edges with a sharp pair of scissors and you're done! 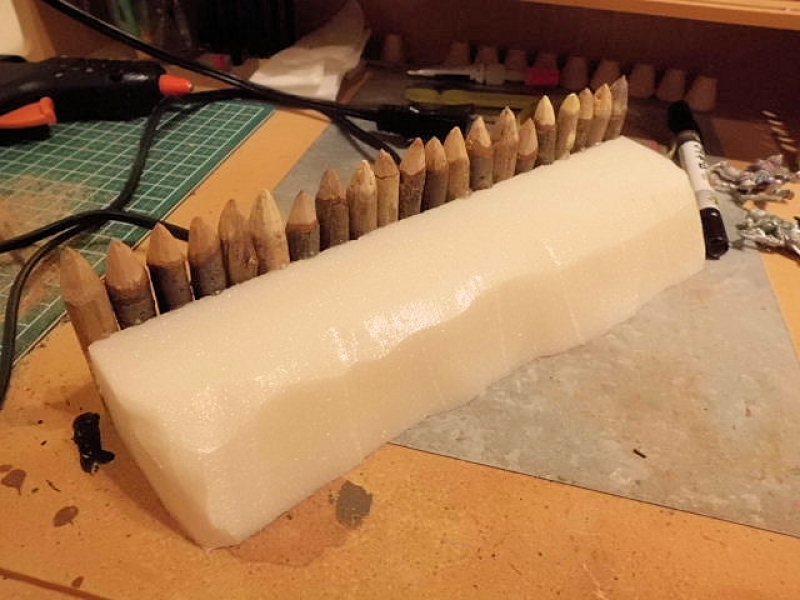 Using 25mm-thickness insulation foam, and roughly cut out an oval shaped palisade and divided it into 4 curves and two short straight sections. One of the straight sections would feature a wide gate of some sort. Euan and I went out for a walk into the nearby woods and came back with a large bag of suitable twigs. I sharpened these one by one (oh my god, that was tedious!!) 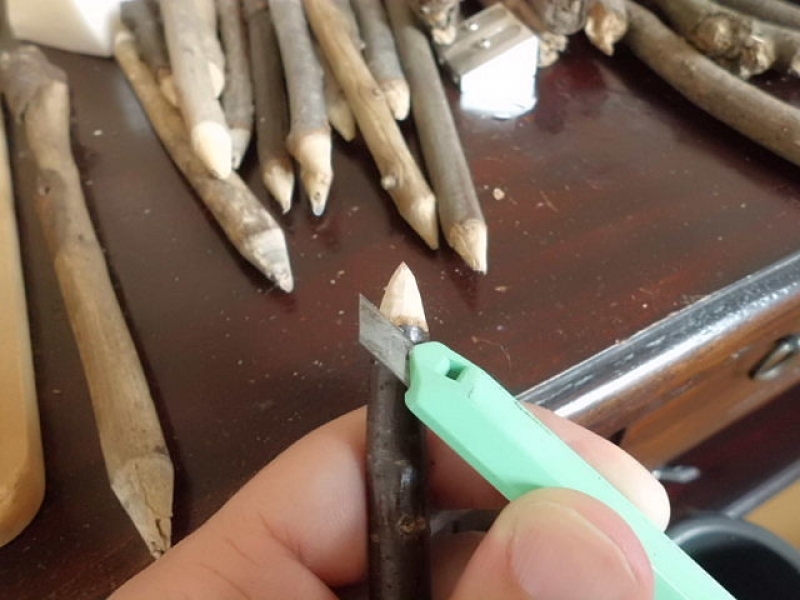 using a pencil sharpener and then trimmed the ends to a more realistic axe-hewn shape. Here's the middle palisade section from the back, with the first of the "tree trunks" cut to size. I then stuck each twig on to the foam with a hot glue gun. Here's the completed palisade. 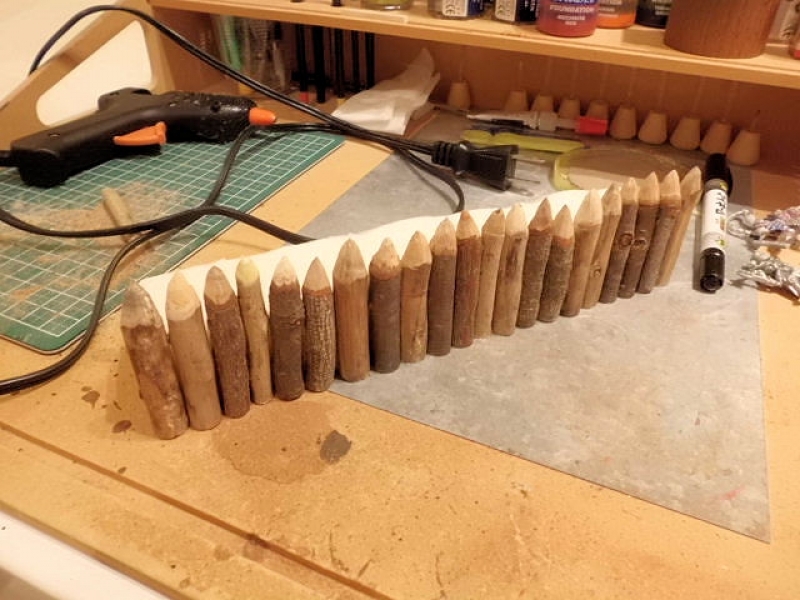 When I have a few more sections completed, I will texture and paint all of them to try and match a wide variety of tabletop colours - grass, dirt, ash, and snow? Looks a bit rubbish from the back, which will obviously become the inner side of the palisade. Texture and static grass will fix that! 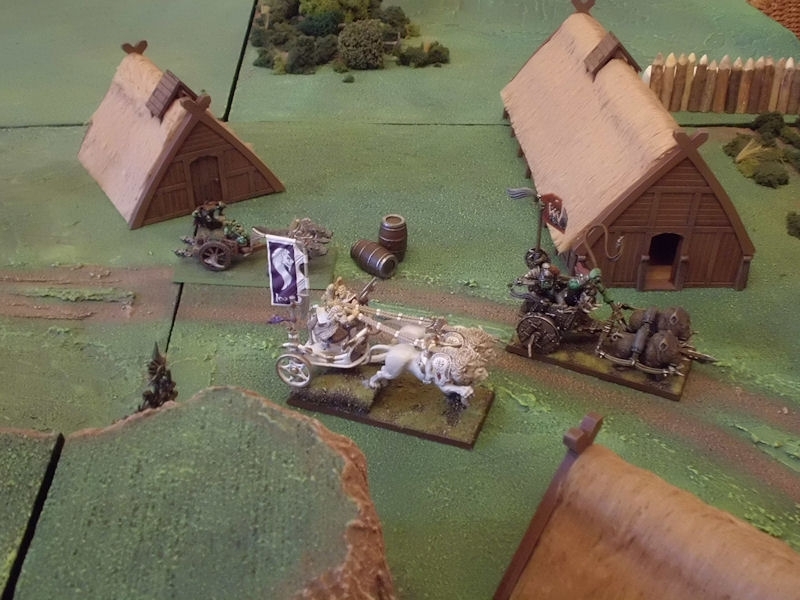 Lastly, here's a quick pic of the completed buildings (with the incomplete palisade in the background) being used as a racecourse by these mad charioteers. 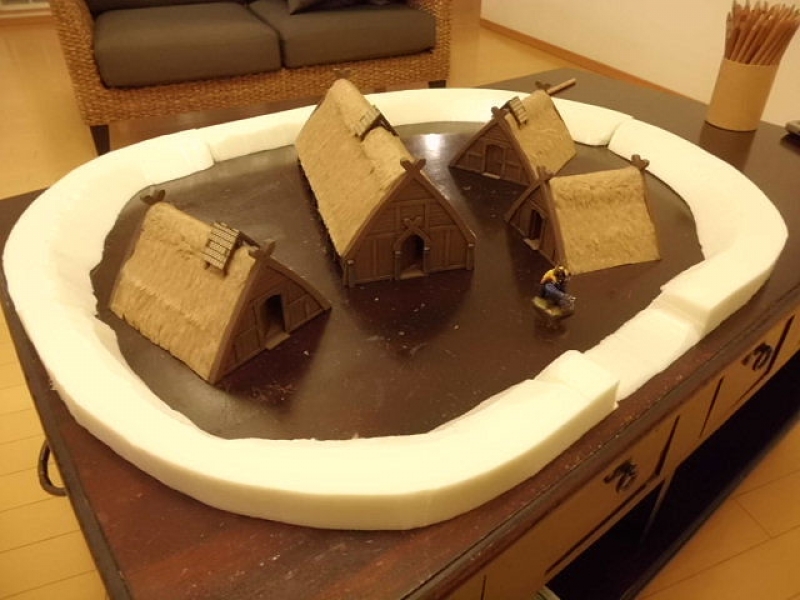 The buildings really look pretty good and the thatch looks highly realistic, and the kits were excellent value for money, I think. Strongly recommended! Hi Mark! Good to hear from you again. 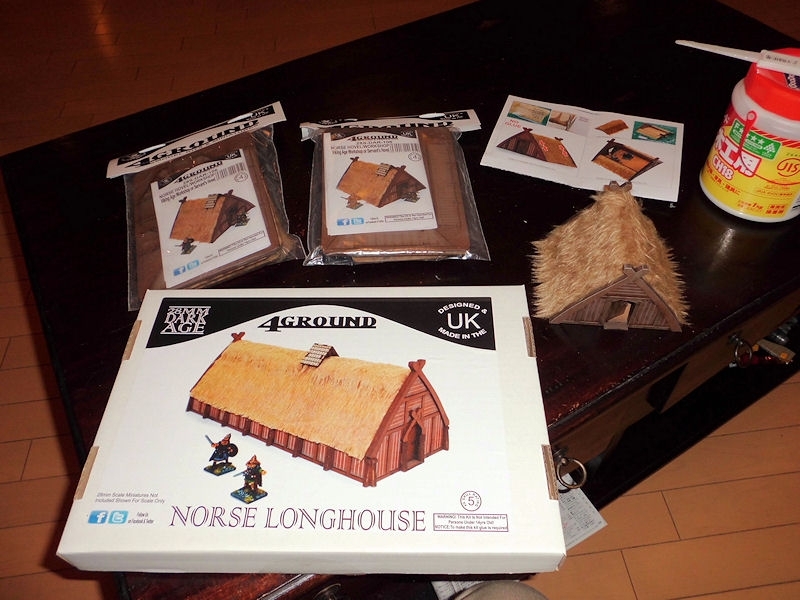 They're nice kits, those longhouses. The teddy bear fur as thatch is such an inspired idea. We're just getting into feudal Japan stuff here (I heard you bought Test of Honour for Liam's birthday - great choice! 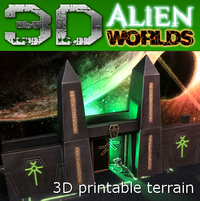 ), but I'm going to try 3D printing my own terrain for that if I can. Failing that, I'll be choosing more of this type of MDF kit, I think. Yes / was looking at Test Of Honour scenery! Looks great! All card/ Tori easy one but bell house ( my other favourite!) fiddly to do on YouTube video! 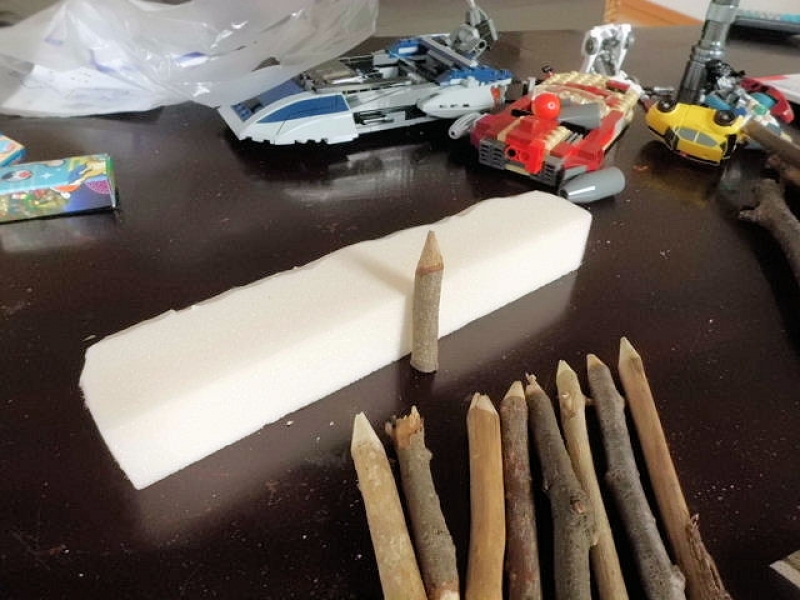 Liam said you were doing 3D printing!! I look forward to seeing the results!! Is a lovely looking game/hope good to play too! And great Club has taken on-board!!! 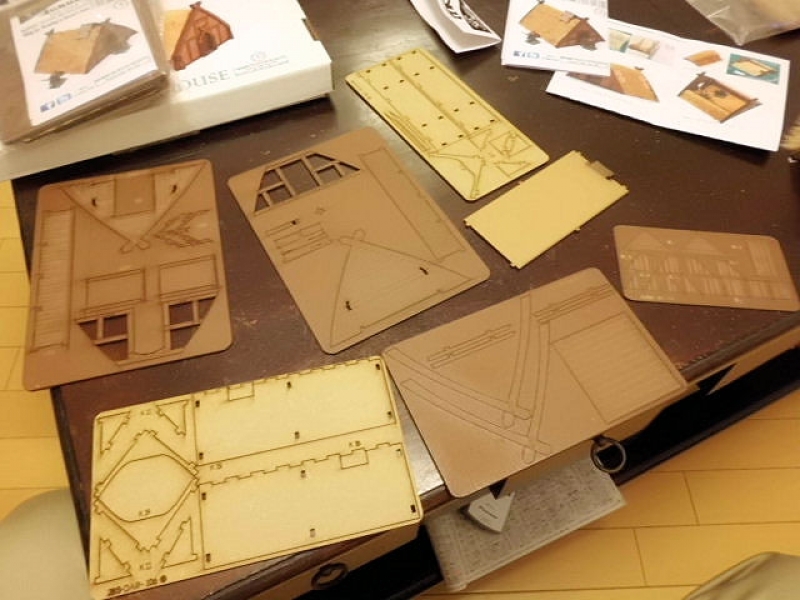 << High Elf Port Board : ハイエルフの港ボード PART 7 Finished!